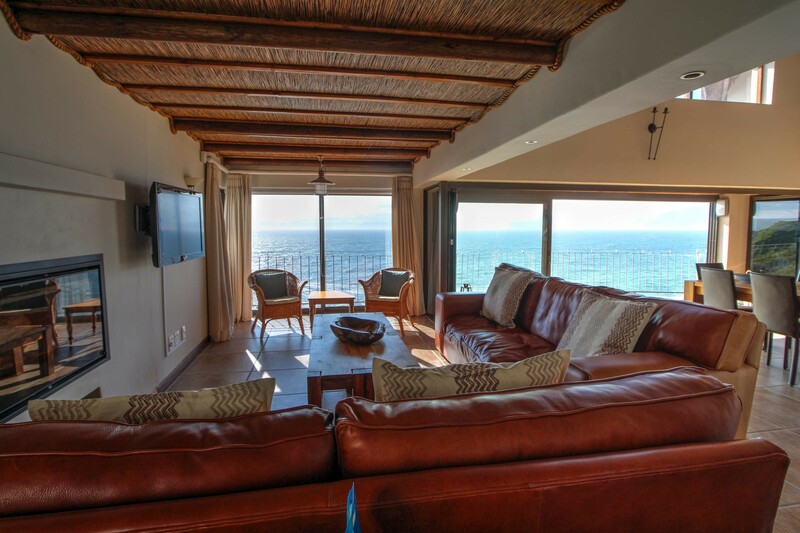 Perched on the ocean’s edge, Whale Huys has beautiful unobstructed sea views from all living areas, dining areas and bedrooms. Fall asleep and wake to the sound of the waves gently lapping at the rocks below. Each of the four bedroom opens onto its own sea front balcony. 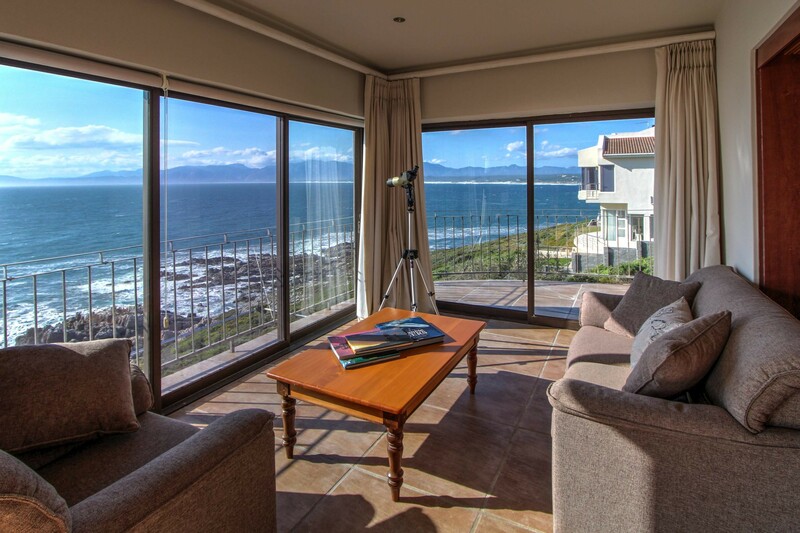 The uninterrupted panoramic views of Walker Bay and the surrounding mountain range extend to Hangklip and even Cape Point on a clear day. 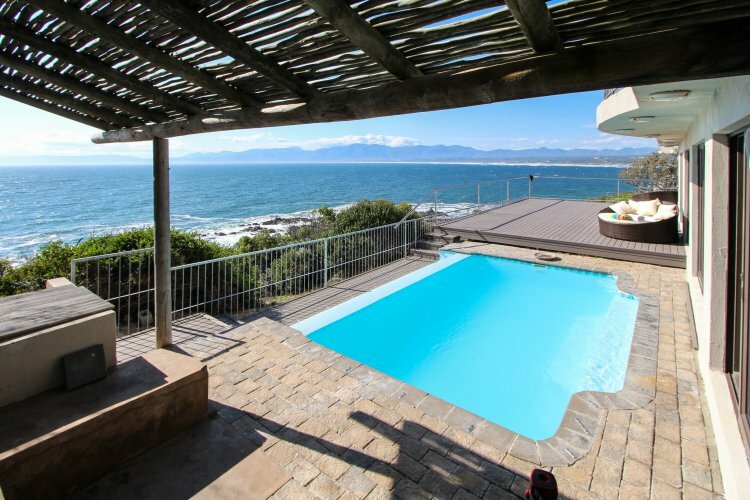 Next to the infinity pool, a private path through the fynbos takes you to the water’s edge and links to a walking trail that extends from Gansbaai on one end to the pristine beaches of the Walker Bay Nature Conservancy near Hermanus on the other side of the bay. The Overberg region has fortunately not suffered from the water crisis that Cape Town has experienced. There are no water restrictions in place. Whale Huys is directly on the Whale Coast in De Kelders, (Overberg region, Western Cape. 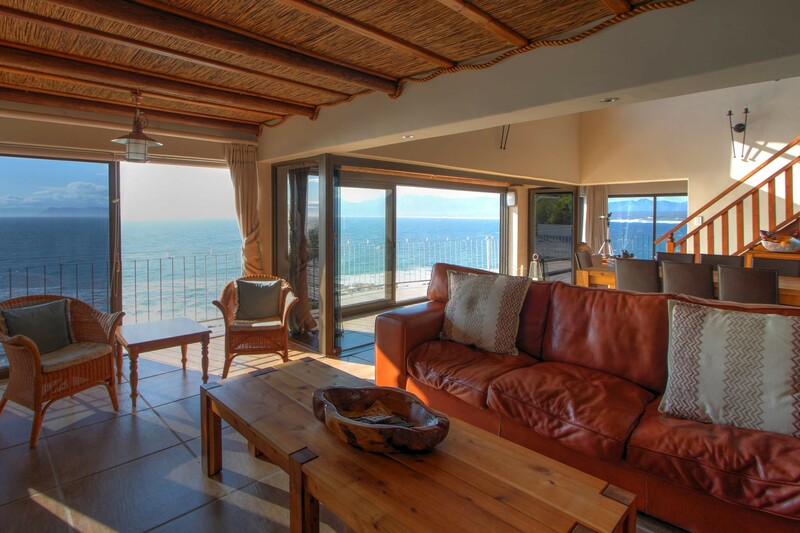 South Africa) you can experience some of the best land based whale watching in the world (June to November) directly from the villa. Also during the rest of the year, dolphins, seals, dassies and dozens of species of birds provide a delightful contact with nature. 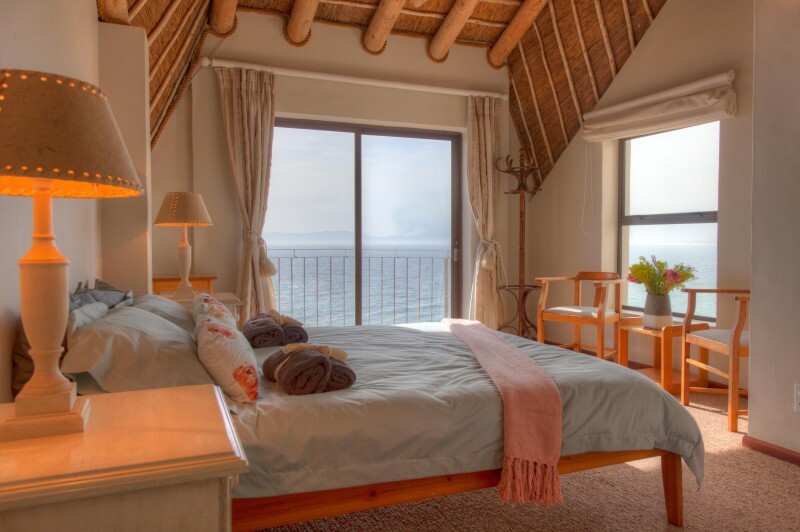 Combining the warmth and character of traditional thatched roof architecture with the luxury of a modern holiday villa, Whale Huys has conveniences like basic satellite TV, wireless internet and a laptop you can use to check your mail or surf the web. A private chef and daily maid services are available at an extra charge. Whale Huys is your first step to relaxation. With its open plan living area the house has a spacious rustic feeling. The thatch roof and cathedral ceilings keeps the villa cool even on the hottest of days. With stupendous views of the ocean from every room, there are various cozy areas to relax, look out over the sea or cuddle up next to the fireplace. The main entrance to Whale Huys is on this floor. The living/dining room space is open plan. The central atrium area has 10+ meter ceilings. Glass sliding doors and a balcony extend over the length of the house providing views of the ocean from three sides. There is a large flat-screen TV, (basic satellite) and a DVD Player. The modern kitchen with a working island featuring a ceramic stove-top and full-size oven. Additionally there is a microwave, dishwasher, coffee maker and large refrigerator with ice and water on tap. There is also a double sink and a separate tap for filtered water. The kitchen is further well equipped with utensils, plates, glassware and cutlery even for large groups, Next to the kitchen there is a small office area with a laptop for doing emails or web surfing. The main bedrooms is also on this floor with its private balcony. 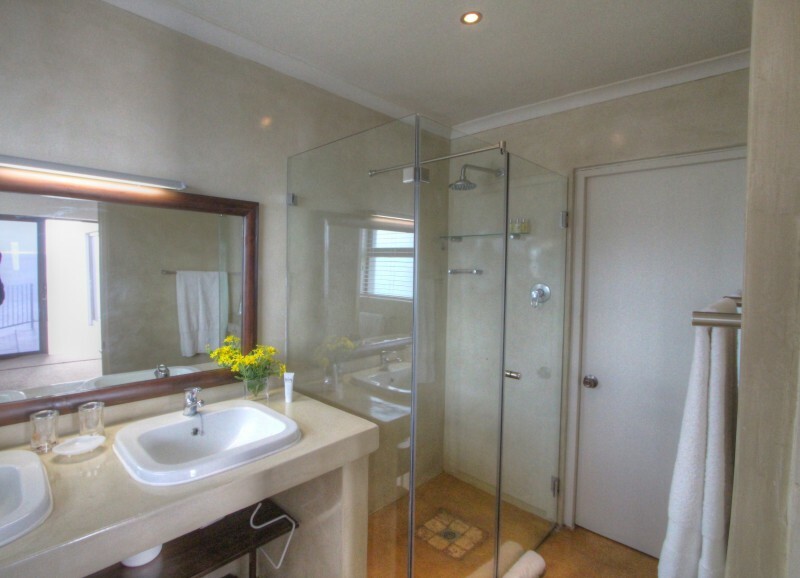 It has built-in cupboards and an en-suite bathroom with double sink, large walk-in shower and separate toilet. There is a guest toilet on this level as well. One flight down, this level features a smaller kitchen/bar with full-size refrigerator, and an outdoor braai area. There is a large indoor seating area across the length of the house that can be used for dining when having a braai. This is the level where the infinity pool is located. Additionally there is an outdoor seating area, outdoor shower and a laundry room. There are three bedrooms located on this level, each with its own bathroom and balcony. Two bedrooms are to the left of the stairs, while a wooden walkway across the atrium area connects to the third bedroom. Two of the upstairs bathrooms have showers and one has a bathtub as well as a separate shower. 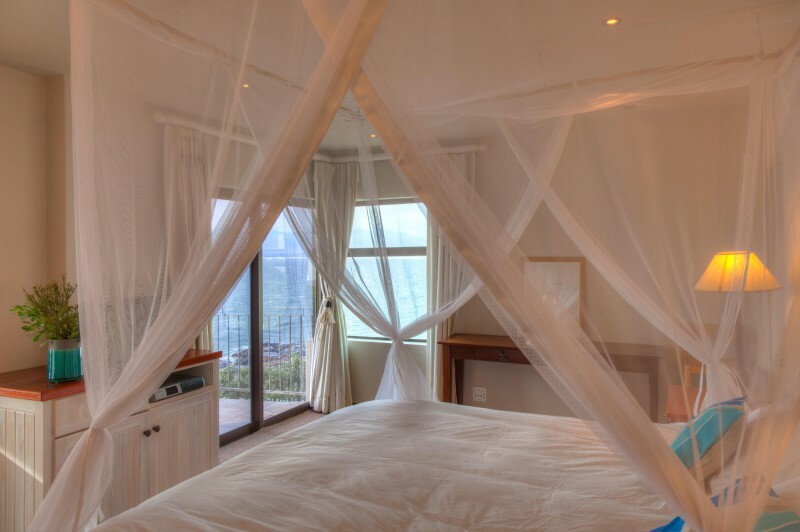 One of the unique of the villa is that all bedrooms have ocean views from two directions. All bedrooms have built in white-washed cupboards. De Kelders is one of the quietest and safest communities on the Whale Coast. 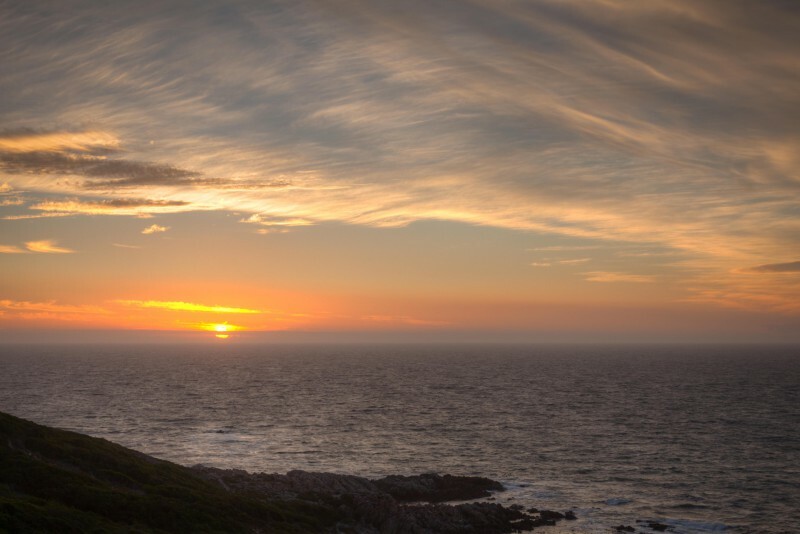 The fishing town of Gansbaai is just 5 minutes away with supermarkets, banks, a gym, and several cafes and restaurants. Stanford, a small town renowned for its quaint restaurants is 10 minutes by car. For a larger variety of shops Hermanus is just 25 minutes away on the other side of the bay. The area is rich in culture and things to do. Elim, a world heritage village, is 30 minutes away. Active adventures also abound, including wilderness and beachside horseback riding (African Horse Company is just 10 minutes away). South Africa's shark cage diving capital, Kleinbaai, is just 10 minutes away. In fact, you can see all of the ‘Marine Big 5’ within a 45 minute radius of the villa.) A number of wine estates in the area offer some of the best wines of South Africa including the Hemel en Aarde valley, the Stanford Valley, and Lomond wines. Wine tasting can be done six days, and in some places 7 days a week. 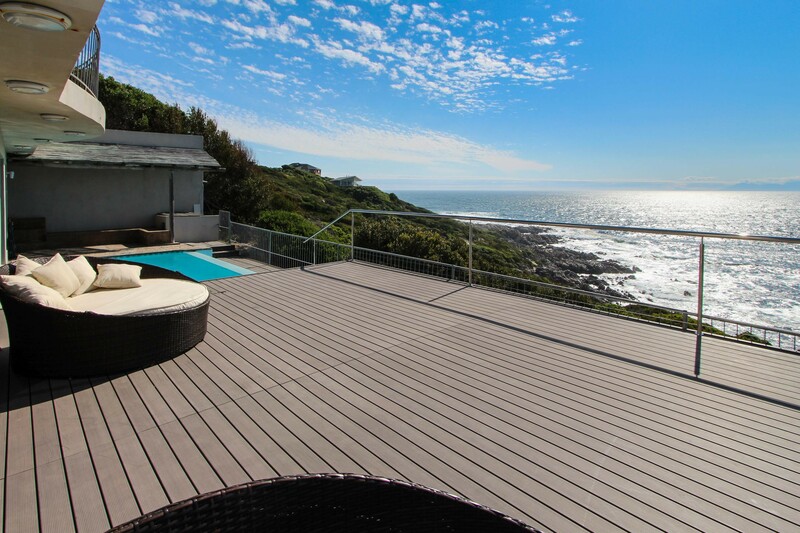 Arrive in the afternoon, and enjoy a sundowner on the deck watching the sun set over the ocean. Book the shark boat for the next day. (good to do this early in your stay or even before you arrive, as depending on weather conditions boats may not go out every day). Early start for shark cage diving or whale watching boat tour (usually need to be there about 6 am). These boats leave from Kleinbaai (about 10 minutes by car), and the half day tours take you to Dyer Island (inhabited by thousands of seals), and through ‘shark alley’. Bring a jacket as it can be cold on the water. Visit Elim, this village is a World Heritage Site, and was founded by Monrovian missionaries in the 18th century. Even today, residents still live their lives according to the religious principles the village was founded upon. From there proceed to the artists village of Wolvegat. Visit the local galleries and enjoy a local lunch. Book a half-day or day tour with the African Horse Company, and ride through the unspoiled dunes and beach of the Walker Bay Nature Conservancy. Or meander through the fynbos covered hills leading to the Bodhi Khaya, a Buddhist retreat built on a 217 hectare farm that dates back to 1791. Feeling extravagant? Splurge on a 5, 6, or 7 course dinner at Springfontein wine estate in Stanford. The former Michelin star chef’s changing menus never fail to surprise and delight. Go for a hike, and learn about the local fynbos vegetation at the Fernkloof Nature Reserve just before Hermanus, or follow one of the hiking trails in the Kogelberg Nature Reserve in the Hottentots Holland Mountains (entrance near Kleinmond). From there, proceed to Betty’s Bay to see the Stony Point Penguin Colony. Tour the wineries of the Hemel en Aarde valley. Visit the lovely tasting temple of Ataraxia and have lunch with a view at the La Vierge wine estate. You can have bottles sent back home at Wine Village in Hermanus, the largest wine shop in the southern hemisphere. (located at the end of the road from the Hemel and Aarde valley). Visit the crafts market near the waterfront in Hermanus for traditional African souvenirs. Visit Platbos and learn about the Overberg’s indigenous forests from François, an expert on the subject. Just down the road, visit Flower Valley to learn more about the local fynbos and proteas. The Western Cape is the smallest, but most diverse floral kingdom on the planet. Lunch at one of the small cafes in Baardskeerdersbos, and continue on for a hike in De Hoop nature reserve, or for a more relaxed afternoon, visit one of the Cape Agulhas wineries in the afternoon. Black Oyster Catcher has some award winning white wines. Kayak on the lagoon or Klein rivier in Stanford. Have a picnic at the cheese farm in Stanford and visit Raka or one of the other Stanford Valley wineries. 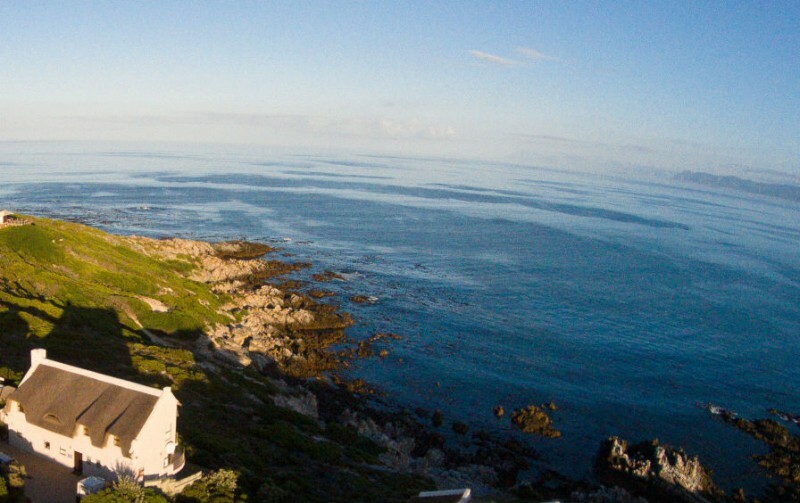 Spend a relaxed afternoon scanning the ocean for signs of activity – you may well see the seals, dolphins that regularly pass by the coast in front of the house. Enjoy a traditional South African ‘braai’ (bbq) on the deck. These are just a few ideas -- check out Xplorio.com for more suggestions in Stanford and Gansbaai. Remember to check if there are any culture or art festivals going on, you can information about many of these on Xplorio as well.